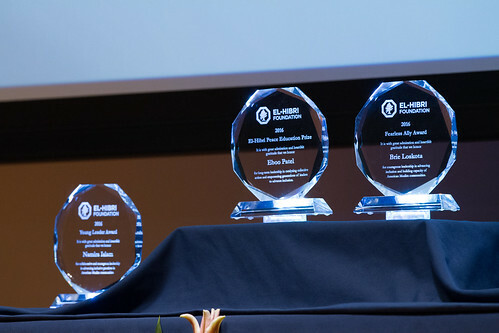 On October 27, 2016, the El-Hibri Foundation held its tenth annual Peace Awards Ceremony to honor three individuals who have demonstrated courageous leadership in advancing inclusion, building capacity, and organizing communities for positive social change. In a climate where fear and divisiveness are far too prominent in public discourse, their stories provided much-needed hope and inspiration for people of all backgrounds to celebrate the hard work of advocates for inclusion. These outstanding leaders are continuing to build community despite every attempt around them to divide, and are working to empower future generations of leaders to join them in this movement. The awards ceremony celebrated the American values of dignity, fairness, and respect to all communities. Comedian and SiriusXM radio host Dean Obeidallah served as Master of Ceremonies for the event. Missed the ceremony? Check out these photos. You can also watch video clips from the ceremony below.